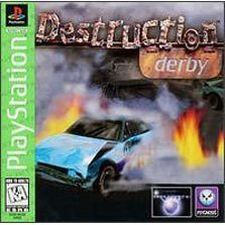 Destruction Derby is a PS One game available for download from the PSP store for 5 bucks. It's a good game for it's time and is still a decent game today. 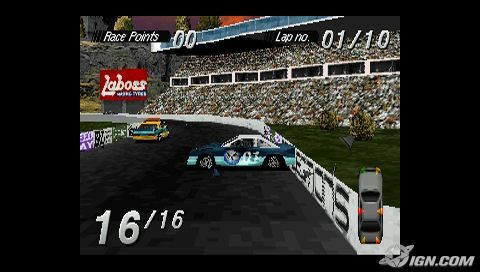 Modes of gameplay include: Wreckin' Racing, Stock Car Racing, Time Trials, and of course Destruction Derby. Within those modes are sub-modes: Race Practice, Championship, Multi-Player, and Duel modes. I've only played the Destruction Derby Championship mode so far. It's basic. You smash your car into other cars. Points are rewarded according to how much damage you inflict on other cars. I noticed if you clip the front or back of a car and their car does a 360, you get 10 points and 360 pops up on the screen. Normal amount of points to get in a single crash seems to be 2, 4, or 6. As time ticks by and you smash, crash, and bash, your car becomes damaged and starts driving like a piece of **** - veers left or right and top speed decreases. Once your front end is done, so are you, and your car is a smoking pile of twisted metal. The controls are standard for a PS One game. X is accelerate. O is brake / reverse. The analog stick can be used to steer the car, which I was pleased to discover. There's 4 camera angles. What else is there really to say about the controls ? The graphics and sound are standard for a PS One game as well. They're kinda bland but not bad. I mean, it's a PS One game from 1995, so what the hell. The sound isn't bad, but the commentary becomes repetitive. The game itself is enjoyable but no thriller. 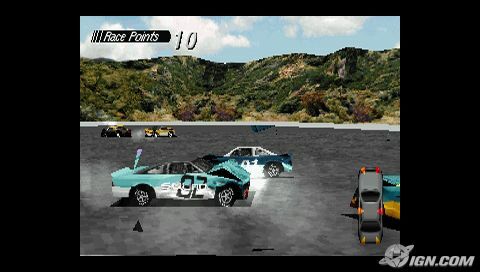 It's not easy to win races or derby rounds and it's fun to smash cars, which supplies challenge and entertainment. It's a decent game and I rate it a 6.5 outta 10.